All this talk of monster stories has motivated me to choose a monster book for day eight of Christie Wright Wild’s PB 14:14 blog challenge, in which participants read, study, and share 14 picture books in 14 days. The focus of this post will be on the important picture book element Plot. I wasn’t sure how to break down the plot of Love Monster, so I mozied on over to Christie’s blog, Write Wild, to see how she does it. Christie reminds us that there are five main parts to Plot: exposition, rising action (and conflict), climax, falling action, and resolution. And that Plot, Character, and Conflict all work together. So here’s my Plot analysis of Love Monster. Exposition: Monster is funny-looking. He lives in a world of cute, fluffy things that everyone loves. No one loves Monster. Monster sets off to look for love. 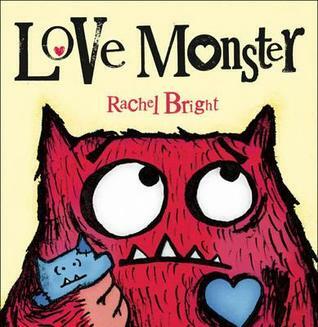 Rising Action (and Conflict): Monster wanted to be loved, but no one loved him because he wasn’t cute and fluffy, so he set off to find someone who would love him just the way he is. “He looked high. He looked low. He looked middle-ish.” (I love that last line!) Then he thought he found what he was looking for, but he was wrong. Climax: Things get worse. Monster gets caught in the rain. Then it gets dark outside, and scary. Falling Action: Monster has lost all of his “oomph” and decides to give up and go home. So he waits at the bus stop for the bus. Even though Monster is described as “funny-looking” and “a-bit-googly-eyed”, I think he is absolutely adorable and definitely lovable. He has personality that shows, not only in the fantastic illustrations, but also through his actions. The reader might feel sorry for him because nobody loves him, but Monster is not the “moping-around sort”. Therefore, he set off in search of love. 2. There are hearts scattered throughout the book, even inside letters. Nice touch! 3. The illustrations were created in a very unique way. Here’s what it says on the back jacket flap: “Love Monster was illustrated with a technique called solar etching, which uses ultraviolet light to create printing plates. So the monster in this book is , quite literally, made of sunshine.” Love it! Lauri, great review. I am going to have to try to find this one. Your plot analysis was very well done, and that’s an element I haven’t examined yet. May try that this week on some of my selections, since you’ve given me a good guide. Thanks! Thanks, Damon! So far I’ve examined 8 out of 10 picture book elements. I’m left with theme and word-play, both of which I briefly mentioned in other posts, but didn’t focus on. I’m hoping to find some good examples for both this week. Yes indeed! Thanks for commenting!